Around dusk, Mark and I arrived at the Hare Krishna Temple, in Sydney’s inner-suburb of Paddington, and entered the quaint little shop-front. The air was heavy with incense smoke. 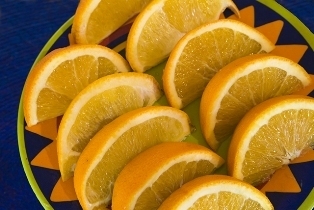 After sitting through a lecture on Bhagavad-gita we were served refreshments from a large platter – chilled wedges of orange, dried figs, and little cups of warm, nutmeg and banana-infused milk. The philosophy had not really sunk in, but the taste of the food sure did. Despite it being so simple, I had never tasted anything so wonderfully delicious. The tastes seem to explode in my mouth. A young English girl in a sari invited us back on Sunday to what she called “The Love Feast”. During the next few days I could not get the taste of that food out of my mind. At the feast on Sunday there were more taste sensations. Mark and I sat cross-legged on the carpeted floor in the tiny Oxford Street shopfront along with about fifty other first-timers and savoured the newly encountered flavours. There were numerous dishes, but the two that remain in my mind were the warm, firm buttery pudding made from semolina called halava, and slices of eggplant dipped in a spicy chickpea flour batter and fried in ghee with a haunting elusive flavour that I had never encountered. I asked a lanky, bright-faced monk dressed in saffron cloth if he could identify what that taste was, and he answered with a grin ‘asafetida’. I had no idea what that was, but I was hooked on the taste. Soon I started to make regular visits to the temple after school. One Friday evening, the young saffron-clad devotee, whose name I learned was Upananda, invited me down creaky steep stairs to help him in the dimly-lit temple kitchen. 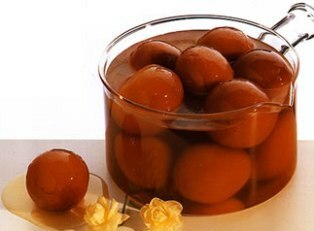 He was rolling small balls of soft, milky-coloured dough that were to become a sweet called Gulab Jamuns. The task was a long one – at least 2 hours – but the time went fast as Upananda regaled me with the fascinating story of what we were actually doing in that tiny basement kitchen.